Ignoring the data which is laying around can be a costly bet for any business in today's world. Using effective analytics or big data tools hence becomes imperative to unlock the power of data. Organizations, independent entities, governments, police and political parties, among others are finally investing time and money in unlocking the power of data. Today, there is a common belief that data has become the new currency, which can yield dividend if it is adequately stored, mined and analyzed. Organizations need to make investments to turn their data into dollars and use the best of breed big data tools (NOSQL or Hadoop based whichever fits their requirements). At the same time, it is important to see in what ways businesses can use analytics or big data tools. Straightway hopping to analytics or big data tools is neither suggested nor advised. It can be risky in the sense that your business may not be appropriately positioned for big data solution consumption. In order to understand how data is becoming critical in changing the course of action for several entities, Dataquest had Souma Das, Managing Director, Qlik India put in a lot of examples. “Law enforcement agencies use data to predict crime and design prevention techniques. Political parties use it to win election campaigns. Sporting coaches use data to either understand opposition tactics or help their athletes perform better. And healthcare organisations use it deliver better patient care. So it’s not just about the volume of the data, but it’s about seeing what lies in the data, and making informed decisions to shape businesses and lives,” avers Das. Data has become the guiding torch for businesses which lost way to the digital disruption in the recent years. It is the only instrument which can potentially fight their way against the startups. “Enterprises that adopt big data can leapfrog the curve ahead of their competition as businesses are able to cross-sell and upsell to their customers efficiently harnessing the power of big data analytics. Using social networks, SMS banking, near field communication to provide 24X7 banking services on the go is an example of the data-driven decision-making embraced by enterprises,” comments Ravikumar Sreedharan, Managing Director, Unisys India. 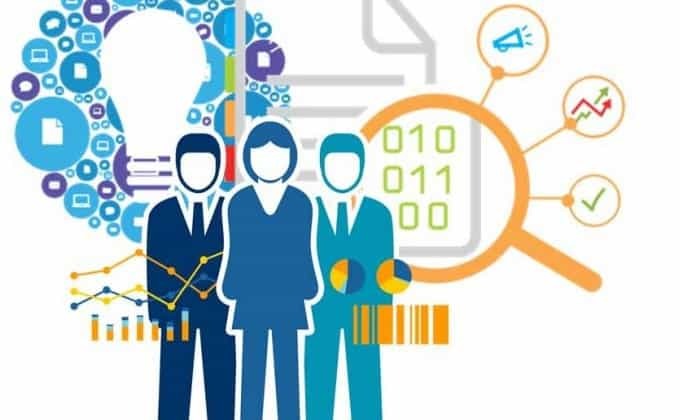 Big data has the potential to help organizations with the right set of insights into data they have, thereby allowing them to synchronize well with their employees, partners and customers. According to IDC, by 2020 there will be 44 trillion gigabytes of information out there; about ten times the amount of data there is today. Soon all of us would be measuring data by zettabytes — 1 sextillion bytes. The figures point out at the urgency to embrace analytics or big data. Those who do not do this may have to face the repercussions. An Accenture survey supports this thought when underlines that 79 percent of executives believe that failing to embrace big data can put companies at risk of losing their competitive advantage. Companies, especially the new age companies which are 100% tech-driven, have begun to leverage big data to take early advantage. This move is giving them an edge over the competition. Their insights – predictive, prescriptive, preventive – are said to be far more stronger to handle with any situation, good, bad or worse as their decisions are not intuition-driven but taken using the data. “Increasingly big data is becoming a core component of an organization’s strategy, especially given that it is all about innovation; finding new insights about customers, operations or the market. As a result, big data is increasingly being seen as a fundamental building block of competitive advantage… if a company doesn’t have the data, and the people, tools and culture to harness it and create innovative products and services, it will be at a serious disadvantage to any of its rivals that do,” says Subash Nambiar, VP, Technology business, Oracle India. There can be enough debate around whether or not every data is useful. But most experts will advise you that secrets of business success lie deep within the data which you possess or which is there in the open domain – the internet. “Big Data is enormously being used by big companies to outdo the competitions. 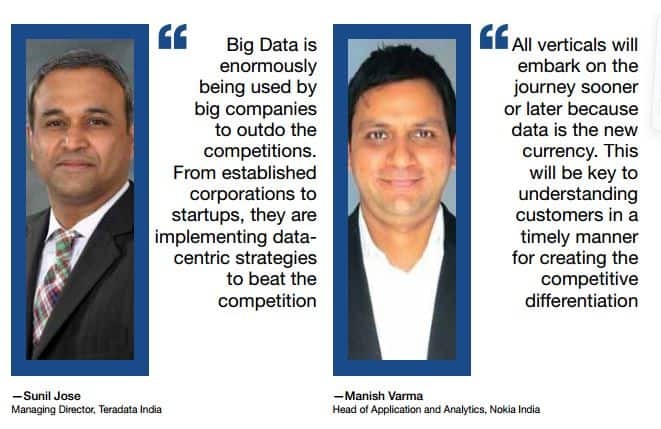 From established corporations to startups, they are implementing data-centric strategies to beat the competition,” says Sunil Jose, Managing Director, Teradata India. In order to unlock these secrets, what is required most is the use of appropriate analytical tools. These tools can dig out the data for business growth. If mined and analysed properly, data can transform organizations and can give unprecedented results. Those leading the change have embraced big data from both within and outside the enterprise, including structured and unstructured data, machine data, and online and mobile data to supplement their organizational data and provide the basis for historical and forward-looking views. All of the world’s biggest Internet-based conglomerates – Google, Amazon or Facebook – would cease to exist, if they stop using big data. Google, Amazon and Facebook, among others, mine data to serve us with more relevant advertising and results. There is always a race among them to know what the customer needs before he/she can demand. In short, data has become their bread and butter or in other words, their revenue source. OYO Rooms is one of the leading startups in India which is using analytics or data science to identify the right demand and predict the nest best action for each user to enhance their experience. 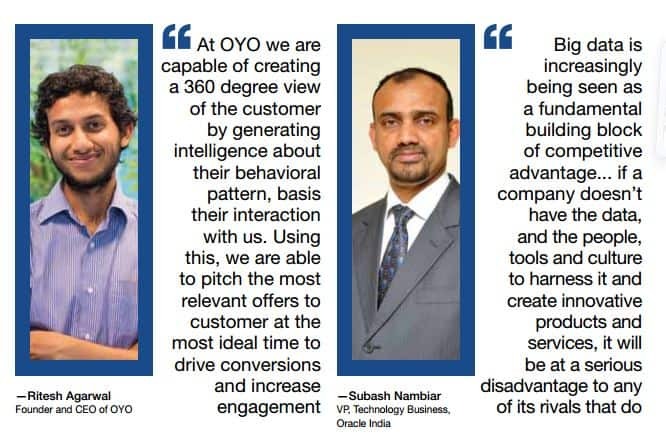 “At OYO we are capable of creating a 360 degree view of the customer by generating intelligence about their behavioral pattern, basis their interaction with us. Using this, we are able to pitch the most relevant offers to customer at the most ideal time to drive conversions and increase engagement,” reveals Ritesh Agarwal, Founder and CEO of OYO. Similarly, there are use cases among small startups which are able to beat the large organizations in terms of agility and speed to serve customers. It only tells how analytics can empower an organization and make it a formidable force for its competitors. Well, the purpose of this story is way beyond belittling the competition. Organizations – big, mid or small – have to respect data which they have and which they can acquire. “All verticals will embark on the journey sooner or later because data is the new currency. This will be key to understanding customers in timely manner for creating the competitive differentiation either through personalization or proactive action or creating wow factor based on need because technology and other tangible things can be easily copied but not culture that is driven by power of data science,” opines Manish Varma, Head of Application and Analytics, Nokia India. Furthermore traditional BFSI and retailers are also making investments to harness the power of big data. One big example is American Express which uses big data to forecast customer loyalty. Even big data and analytics are playing a key role in the on-going US presidential elections. Agencies such as Nate Silver uses big data to predict everything from presidential elections to NBA champions. The good thing is the insights gathered using big data are largely true, because they are based on the user behavior in the connected or the always-on world. “The biggest impact will be evident across verticals with the highest spend including financial services, telecommunications, manufacturing and healthcare. 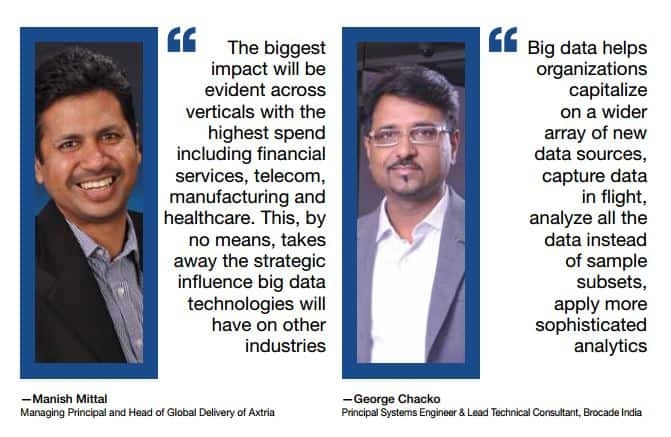 This, by no means, takes away the strategic influence big data technologies will have on other industries,” shares Manish Mittal: Managing Principal and Head of Global Delivery of Axtria. Decision-makers in many mid-size organizations are realizing it is necessary to extract value out of data they have. Many ecommerce companies are constantly monitoring social networks, search engines and mobile usage to predict buyer requirements. In this way, they are able to offer contextual and personalized offers. The internet of things, which has begun to shape up and redefine many aspects of customer service, is set to trigger the data tsunami in the future. At present, the data is coming from the internet and other connected devices. But as the IoT becomes mainstream, it will explode in great numbers and would urge for a greater need to apply big data tools in every organization. For example, as Mittal of Axtria says, there is an estimated 50 petabytes of data in the healthcare realm – predicted to grow to 25,000 petabytes by 2020. There is data available across just about every aspect of the patient journey and stakeholder landscape. This wealth of information is being used across the value chain to evaluate outcomes and the cost to achieve these outcomes. With increased usage of wearable or connected health devices, the day is not far when e-medication will replace a large portion of physician visits and patients will be able to self-diagnose basic symptoms to cure themselves. In addition, it is about seeking answers to several key questions. BI tools have tried to do that in the past and even in the present. But many of traditional BI tools are not capable to deal with the pace of data which is growing at a humungous speed. Modern analytics engines or big data applications are said to be the reply to traditional archaic BI software. “Analytics can help organizations answer new questions about business operations and advance decision-making and uncover insights that may prove to be valuable to the organization. Big data analytics helps organizations capitalize on a wider array of new data sources, capture data in flight, analyze all the data instead of sample subsets, apply more sophisticated analytics to it and get answers in minutes that formerly took hours or days,” believes George Chacko, Principal Systems Engineer & Lead Technical Consultant, Brocade India. For the time being, the use of big data within a company does not replace the need for a relational database or indeed a data warehouse, reveals Oracle. “Companies use these more traditional tools for important business purposes – reporting financials, payroll and such like. These activities require the data to be exact – there is no margin for error when it comes to financial reporting or payroll,” adds Nambiar of Oracle India. Supporting the need for a data warehouse for effective use of big data, Jose from Taradata negates the veracity of arguments which do not favor the need for a data warehouse for using analytics. “The enterprise data warehouse (EDW) is the backbone of analytics and business intelligence for largest organizations and many midsize firms. How can businesses of all sizes make use of analytics? Reports of the death of the data warehouse may prove to be greatly exaggerated,” argues Jose. Hence majority of experts are of the opinion that big data does not eliminate the need for data warehousing. “The need for data warehousing hasn’t changed. However, the way it’s being done is undergoing a drastic change. 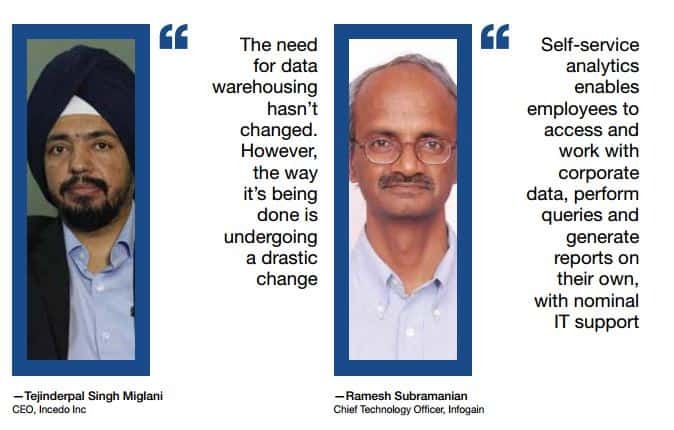 In earlier days data warehousing comprised of designing canonical data models, normalizing the data, extracting it from various heterogeneous and homogenous sources, transformation the data before data load which was the ETL approach (Extraction, Transformation and Loading of data),” asserts Tejinderpal Singh Miglani, CEO, Incedo Inc.
Data warehousing lets CIOs work effecctively on digging out insights from the data – structured or unstructured. “To start with, enterprises need to identify a problem area in their business – growth, innovation, marketing, etc. 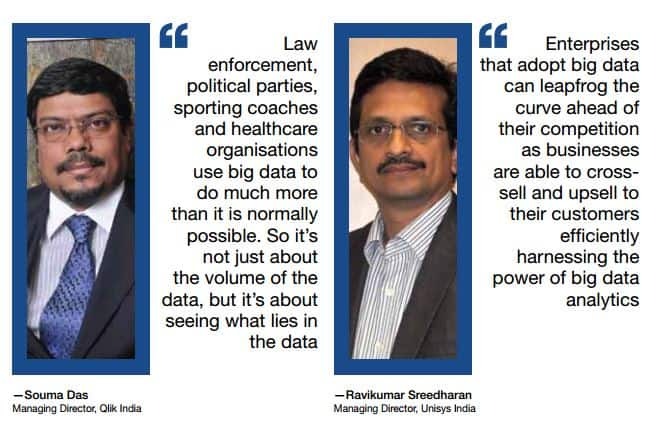 Then it makes sense to deploy analytics to this specific problem and witness the results before deployment across the board,” suggests Sreedharan of Unisys India. Is big data an option for companies that may not have the computing and financial resources of a large organization? Whether a startup or a small player, your competition is straight with the biggies in the business. Small businesses have the advantage of agility, making it perfectly suited to act on data-driven insights. Experts do also believe that the use of big data matters, not the deployment. It makes sense for SMEs, especially e-commerce companies to adopt big data and analytics to maintain a competitive edge. “Analyzing inventory data from a smart vending machine in combination with the events calendar for the venue in which the vending machine is located, will dictate the optimal product mix and replenishment schedule for the vending machine,” clarifies Nambiar while giving an example. Since SMEs are often faced with budgetary constraints and resource crunch, they should properly align and prioritize big data implementation with the business drivers. They should look at big data investment as an extension to their existing information architecture. CIOs can use analytics tools that help them to gain insights into what the users are most looking for. Cloud computing and services like Microsoft’s BI, which lets businesses analyze data from Excel spreadsheets, are more affordable than ever. Technologies like Hadoop and NoSQL put data analyzing tools at the fingertips of any tech-savvy entrepreneur. Believed to be a huge differentiator for all kinds of businesses including the small ones, analytics can expedite their digital transformation journey. Analyzing big data—including “dark data” (as Gartner defines it – ‘information assets that organizations collect, process and store in the course of their regular business activity, but generally fail to use for other purposes’) can yield valuable information which can be used to address the business challenges. Self-service analytics have come up to the scene much faster in last few years, and for a reason of course. CIOs do have the choice to select and deploy these tools to get going. Gartner predicts that by 2018 organizatins will have access to self-service tools, and the applications and projects would be more agile and the challenges of data inconsistencies can be effectively managed with self-analytics tools. “Self-service analytics enables employees to access and work with corporate data, perform queries and generate reports on their own, with nominal IT support. Since business intelligence is important to make smarter, faster decisions, self-service analytics helps reduce business costs, and improve customer experience,” suggests Ramesh Subramanian, Chief Technology Officer, Infogain. Today, this technology is improving quickly, especially in areas such as tools to be able to effectively handle data at each end point without having to compromise on governance, reliability, consistence, quality and security. The biggest advantage of using self-service analytics is that it reduces the dependence on the IT department in any organization. “Today, there are a plethora of tools in the market that help in self-service visualization. Moreover use of bots in Robotic Process Automation (RPA) has revolutionized the way business users interact with the data available. Bots are using Natural Language Processing (NLP) technologies for data analytics, to run complex tool sets and making this available to the average business users. In the old days such kind of complex analytics was only available to BI experts,” further adds Miglani from Incedo Inc. Majority of the world’s population embarked upon the online journey. India is the fastest growing internet market, giving impetus to connected devices and so to the data which is valuable to businesses, ecommerce companies, governments, hospitals and others. It is high time that organizations make a move to analytics to understand what the data wants to speak to them. If they are able to understand the language of the data and act on this, many things would be different. Harnessing Big Data 0 out of 5 based on 0 ratings. 0 user reviews.